This set of photos shows the amazing, magical, Micralite Twofold. 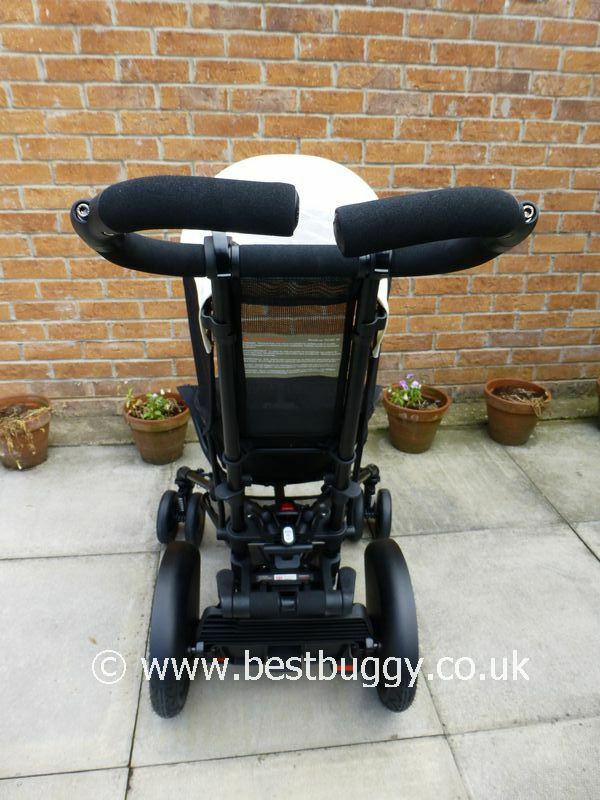 The Micralite Twofold is amazing and magical, because this pushchair has hidden surprises! With a flick on of the brake, a press of a pedal and a quick push forwards, the Micralite Twofold reveals a hidden stand on board for a toddler. If your toddler isn’t old enough for the board, a second seat can be very easily pushed into position behind the first seat (over the board). There is also a huge shopping bag which can be fitted to the Twofold. 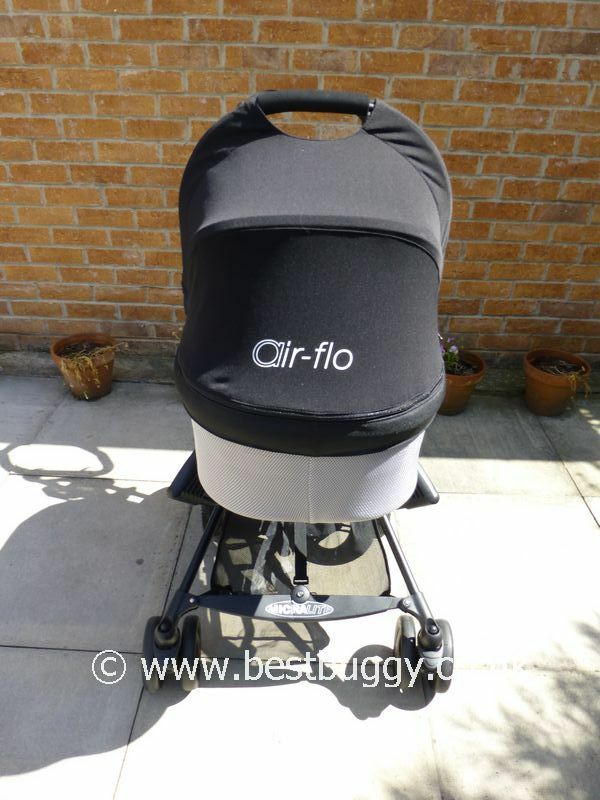 Not only that, but the Twofold seat fabric can be stripped off; adaptors fitted; and then a Maxi Cosi Pebble or Cabriofix infact car seat, or Micralite Air-flo carrycot can be fitted. 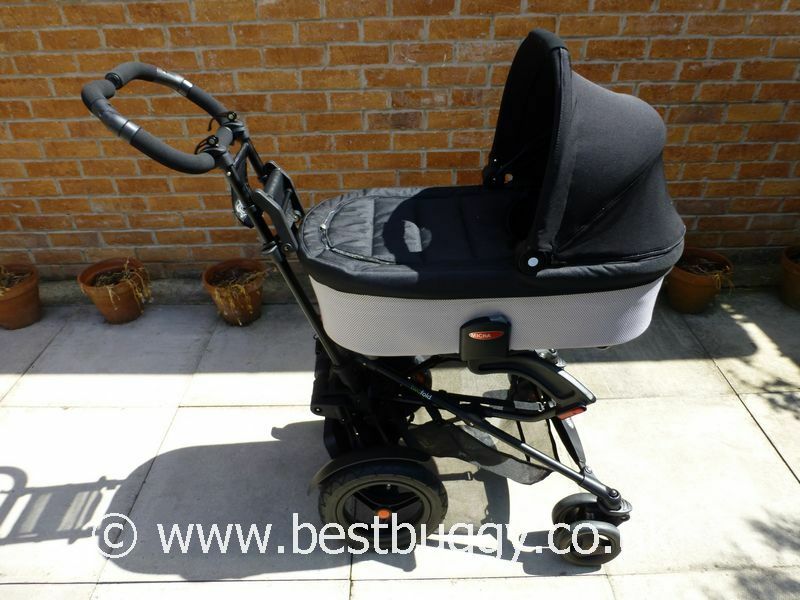 Best of all, the board or second seat can STILL be used with the carrycot or car seat. This makes the Micralite Twofold a very versatile pushchair which can easily take a family from one child, to two children (through various stages and ages) back to one child again. This photoset is complex. It may be best to start with the photos at the bottom of the set which show the various components – the Twofold pushchair, the Air-flo carrycot, second seat, large storage bag, adaptors and raincovers (the round raincover bag is for the seat unit, the long raincover bag is for the carrycot). The carrycot has a with breathable, padded mesh layer which is thickly lined inside. The carrycot folds flat for easy storage. There are also feet on the bottom of the carrycot, and there are D rings to add a harness if desired. In the middle of the photoset, we have tried to show how the Micralite Twofold chassis extends. Extending the chassis is incredibly simple. So easy that I never mind our eldest hopping on and off the board whenever she wants to, because it is so simple to flick the board in and out. 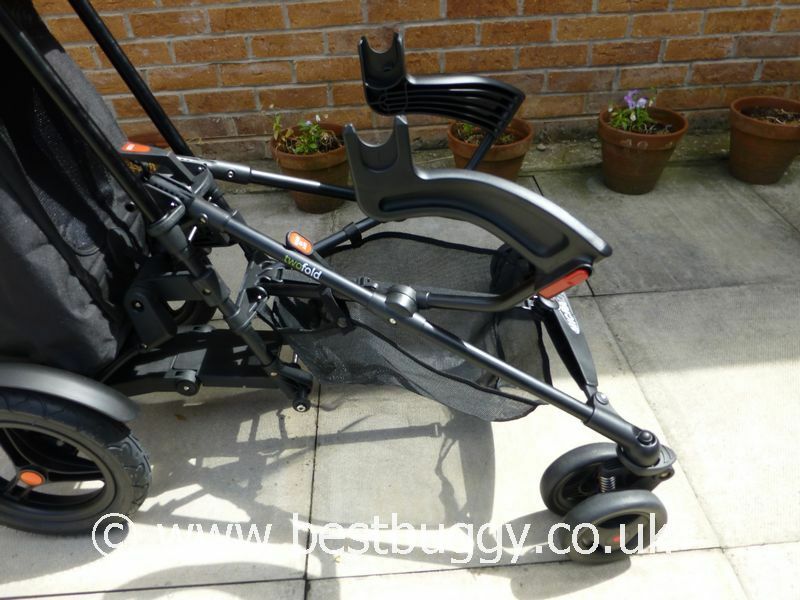 Simply apply the brake, put your foot on a pedal at the bottom of the Twofold and push the pushchair chassis forwards. The chassis very neatly slides out. The wheelguards rotate to a new position also. The toddler board needs flicking down with a foot or hand into position at the end of the unfold. Very, very well designed and engineered! Super cool!!! 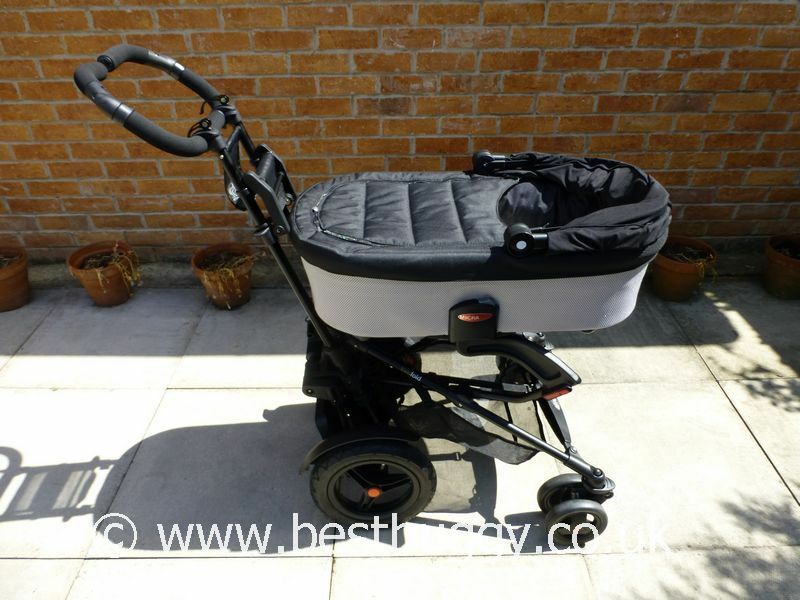 Note also there are two brakes to assist when the pushchair is in the long or short wheelbase positions. The photos then show the different tandem positions using the board and also the seat unit. The photos then detail the second seat unit in use. The second seat literally slides in behind the handlebar, over the board and clicks onto a pin situated on either side of the main seat unit. To release the seat there is a round circle on webbing, situated under the seat unit. Simply pull the ring and the seat releases. Very easy to do! On the rear of the second seat is a small zipped pouch. This contains a hood for the second seat unit to give some shelter from the sun or light rain. We suggest that maybe keeping a light kagoul and pull on waterproof trousers in either this pouch, or the raincover pouch, may be a good idea for a seated toddler. We love the luminous green raincovers of the main seat and carrycot! There is a recline on the main seat which is done by sliding two brackets up two poles. The top is upright, the bottom is reclined. There is no recline on the second seat. Both seats are very thickly padded to give good comfort for the child. The handlebars are super adjustable. We have found that you need different handle positions for the different modes, so it is worth experimenting. The handles have 2 pins on the top, which can be pushed up and open. These allow the handlebar to rotate forwards and backwards. The handlebars have a built in extension piece on each one. These have a sliding collar which moves and allows the handles then to rotate around 360 degrees. There is a good sized basket although access is from the front. The Micralite Twofold has large rear air tyres and smaller lockable swivel plastic front wheels. The Twofold folds very neatly with the toddler board inside, and can then be pulled along or left freestanding. 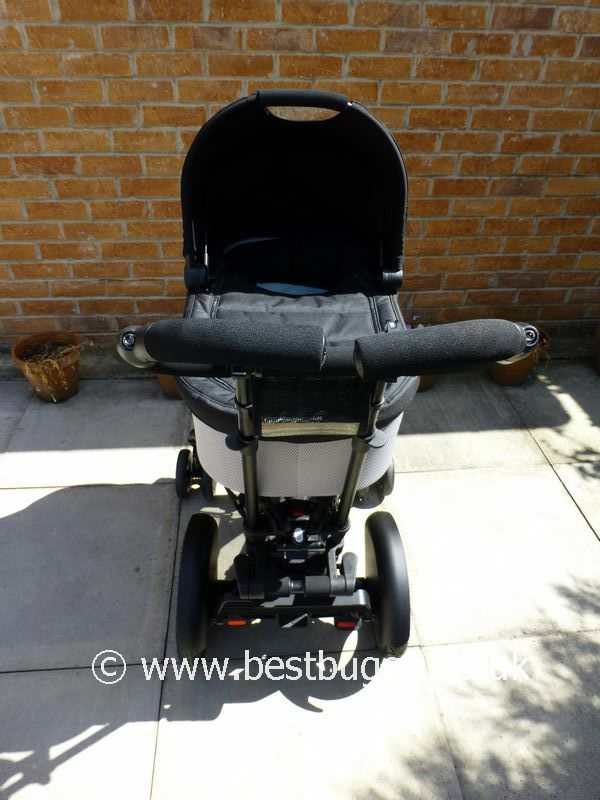 The carrycot, car seat and second seat, plus adaptors need removing to fold. 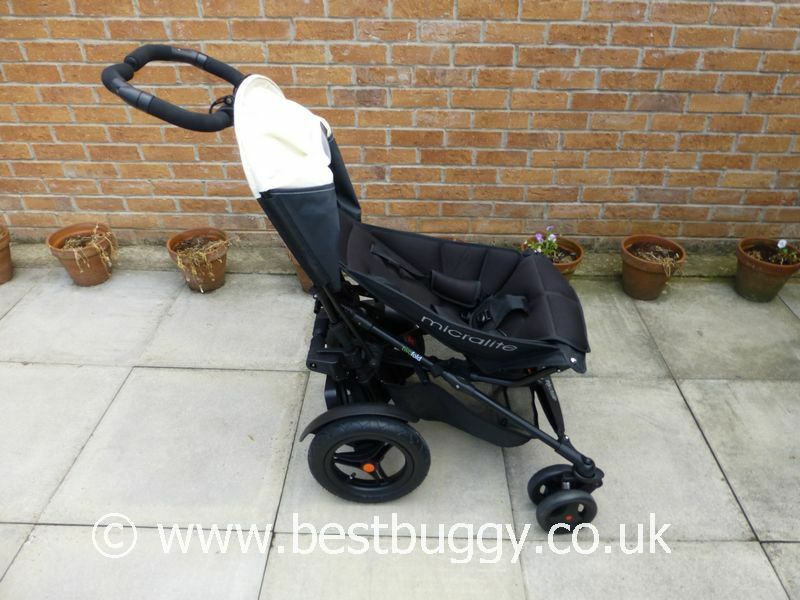 The Micralite Twofold is a fabulous, multipurpose pushchair. Please read our full review for more information. With many thanks to Micralite for their help.